The Venture All Stars JOY playpen is the ultimate foldable baby playpen capable of being set up and folded down in seconds. Lightweight all-steel frame means the playpen remains robust whilst also being portable enough to travel and its patented folding mechanism eliminates steel cross sections as seen on older playpens. The weather resistant floor mat and durable materials mean that the playpen can be used both indoors and outdoors. Portable design and contruction perfect for travelling. 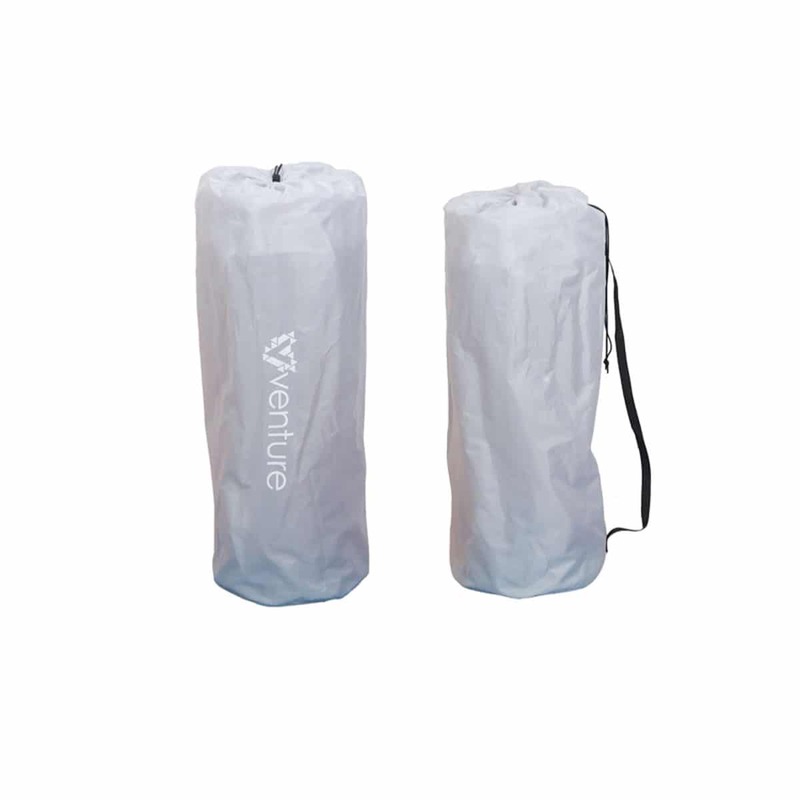 Lightweight construction make it easy to set-up, take down and pack away. Highly durable and weather resisitant materials. Excellent product, versatile and very useful. Timely delivery. Real value for money. Well made and the zip side access is a useful addition. I am really satisfied with this playpen. It is big enough l, my baby is now 7 months old and she will use it for a long time. It is very easy to assemble. I like the zip door as well. Thank you, it is perfect. ? Easy to put up and fold away. Like the zip door. Baby seems comfortable in it. Really happy with this purchase.. I bought it for my 8 month old who is on the move..it’s super easy to put up and down so I can keep it tidied away when not in use. The door is nice as means baby can crawl in and out when I’m in the room, I wanted him to not be scared of it. There is lots of space in the pen so much room that I sat and played with him yesterday with lots of balls. Great for short term solution to keep baby safe whilst you are busy backing pram etc. Product is great. Very sturdy and easy to assemble/disassemble. Delivery very quick. Would highly recommend. Fantastic product and great quality. Can?t wait to use it for my little one. Speedy delivery. 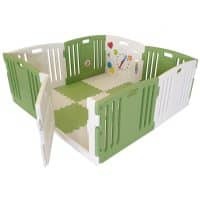 Much nicer in real, photos almost don?t do it justice; I was trying to find a playpen that didn?t look like a dog pen or look too bulky in our front room and this is perfect, easy to assemble and store away. I?ve not used it yet but it seems very good quality and very reasonable price in comparison to some others. Thank you. Great product! Super easy to set up and much better than its competitor, since we had to return the other one due to bad quality. A fantastic product! So easy to put up and take down. Also great that you can easily see into the playpen. Would be even better if the floor was more padded but then it wouldn?t fold up as small so I appreciate that?s not possible. Fantastic product. Very study and strong. It’s also very big to allow a lot of room to move around. Love the gate feature too. Keeps my daughter in one place and allows us to not worry about her whilst we get food ready and go about household chores. She’s safe and it’s comfortable. It doesn’t provide much protection to the flooring below. It’s thin plastic but other than that it’s sturdy does the trick. On other thing the mesh holds up well but there are certain angles if the toddler falls over will manage to bop their head against the stands. But really well built and easy to use. The areangement of the bars on this is much safer than most of the other types as they are more difficult for your baby to bump themselves on. It is also really easy to assemble, you just expand the walls out until the two red brackets click. ? Update: We?ve had this a couple of months now and it really is a great purchase being able to safely play it really brought on the development of our little ones sitting, crawling, standing etc. It?s also really easy to collapse and transport and we took it on holiday (inside uk) with us and also to grandparents occasionally to babysit. Great item with speedy delivery. We’ve been using this for a month or so now and really pleased with it. Super easy to put up and down, it literally just fold in and out and has 2 click buttons to hold it in place. It’s a really good size, plenty of room for baby to crawl around and explore….in fact sometimes mummy & daddy crawl in with babba as she finds it funny!!! As it is portable, the base and fabric to the base and around the too are only very lightly padded but that’s fine on carpet. The mesh sides make it easy to see baby and less upright pokes means less bump risk! The little door is really handy too…i’m 5’2″ and struggle to reach over to get my daughter if she is lying down. Only negative for us is when it arrived, one if the lock buttons had been squashed in so it wouldn’t lock but other half managed to prise it out and it’s been fine since. We’ve just bought this playpen 2 weeks ago & it has been an instant hit with the whole family. Baby loves to play there and is safe & contained. We can leave her there for 20-30 minutes & rest but still see her trough the mesh. The design of the metal bars is very smart & they support the structure but baby cannot hit the head easily on them. The zipped entrance makes it easy to access without carrying a lot of weight while bending over the side. The playpen is foldable and it works great. It only needs pressing 2 buttons & pulling up the pen’s floor & the item is folded. 15 seconds?! It folds very small & it extends very large, so be mindful of space when open (measure well before buying as needs large space in the room). We leave toys in it when folded as well so overall this has been a dream purchase so far. Thank you Venture! Perfect playpen for my 11 month year old. Prior to purchasing this playpen I spent all day everyday chasing him around the front room pulling him away from wires and other hazardous things but now he can crawl and roll around until his hearts content and I don?t need to worry. The mesh is thin enough that he can see the tv through it and it?s big enough that I can get in for playtime. It is also a lot talller than all the other playpens I looked at which is great because my son is so tall. It actually pops up and down in a matter of seconds so it?s not too much of a pain if you want to put it up and down everyday. It?s also wipable material which could go in the garden without getting ruined and has a zip door which he can crawl in and out of when I?m in the room. Would 100% recommend this to anyone unsure of what playpen to get. Especially for the price. I bought the playpen for my twins as they had decided to start crawling at 7 months. The venture seemed the biggest foldable lightweight pen I could find with a base. And I haven’t been disappointed. It’s folds up even smaller than I thought. I move it easily around the house. It’s easy to wipe clean and best of all my twins are happy to play and be in there. Great product. Arrived quickly and very easy to put up and take down. Great product. So easy to use and a brilliant size – much larger than our previous one. I love the fitted mat and the zipped entrance. This is a really fantastic play pen. Easy to open and close ,light enough to be portable. The zip acts like a play tunnel, which was left open to get her used to playing in it first. This playpen is so easy to put up and down. It’s very compact when folded and feels sturdy. My daughter has been very happy playing in it so far! Great value for money, we’re looking forward to taking it out and about over the summer. Bought this for my 11 month son who is crawling to keep him out of mischief. Been using now for over a fortnight and am extremely pleased with the product. It’s super simple to erect and fold away. It’s light enough to carry short distances. I love the ‘door’ feature that allows you to crawl in. 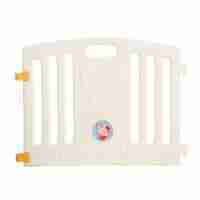 For the money I think it’s great value, well made and without the cross bars that other play pens have which I have read can cause problems with infants climbing out or bumping heads. Nice and quick enclosed safe play area for the little one. Although mine doesn?t stay in it for too long. Folds away quickly and goes into a bag for storage, easily the best thing about it is the design, there’s no bars where my child could bump himself onto its light and big enough for my 6 month yo to explore and crawl about, can’t fault this playpen it’s exactly what I needed. I’m on my third kid, which as any parent of multiples knows – is not the time to start spending money on ‘kit’. However, with two other toddlers to try to keep alive on the beach/camping/in the garden means I’m not able too spend time following the crawling baby around, making sure she’s not stuffing marbles into her mouth. A friend of mine told me I needed one of these playpens – and boy, was she right. It’s up (and down) in seconds – AND single-handed, comes with a carry-bag and is well big enough that she doesn’t get grizzly with the lack of space. Plenty big enough for me to put another one in when she gets lonely and the zip door makes it easy for the big kids to get in but not easy enough for the baby to get out. This will be a life-saver this summer, thank you! My daughter has started to roll constantly in one direction, this was bought originally for when she starts crawling as my house is not the most child friendly. I?m loving the base is it?s smooth and wipable she finds it easier to roll and practice moving around with the slippery material. Perfect. Doesn’t fail in any area. Wish I’d bought it sooner! Excellent product. Easy to pop up and collapse down. Love the zip door opening. Excellent play pen. Great size with plenty of room for my energetic son to crawl around. With so many to choose from we decided to get the Venture playpen for our baby daughter. So far we are very happy with the purchase, it’s very spacious, very well made and quick to put up or put away. 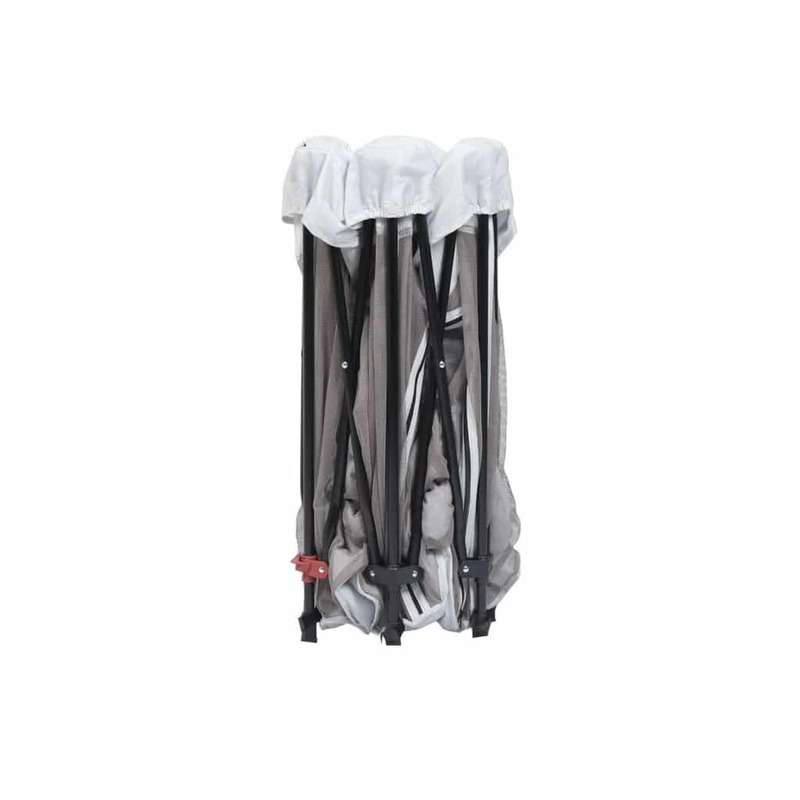 The design has the bars outside of the mesh which is one of the main reasons we choose it. I highly recommend this playpen and we’ll worth the investment. It is huge! My baby has plenty of space to move around safely? Perfect for my little one to play and for me not to worry where he has gone to! Brilliant, much bigger than it appears. Easy to put up and close down, which means it can be moved about – used it in the garden already. We bought this to contain a very active 1 year old in the garden and were so impressed with it that we ended up taking it on holiday. We packed it in with a set of golf clubs but you could easily check it in the hold as a piece of baby equipment. It is good quality and very easy to put up and take down. Most importantly our baby enjoyed playing in it and it gave us peace of mind that he was safe when playing in it by the pool etc. Perfect for keeping a little one out of harms way whilst packing up for a house move. Appears well made and it’s easy to erect and dismantle. Have only used it a couple of times but it certainly looks up to the job. Would recommend it to others. Far superior to the 6 sided steel bar playpen that we previously used which was frankly unsafe and difficult to assemble. Bought this playpen for my 10 month old Grandson to use. It is very easy to put up and take down – less than a minute. It is good quality so will hopefully stand the test of time and use. He is very happy to play in it and it is quite big enough for both him and his mum to comfortably sit in it and play! Love it. The best, the biggest, easiest to use and transfer playpen, what else you need? Excellant product. Exactly what we were looking for and arrived very quickly. Very good playpen. Versatile and spacious. love it. very easy to put up and take down with frequency. Fantastic playpen and the zip opening makes it easy to get all the toys out at the end of the day. The baby can see through the mesh so they are happier for longer! Really quick and easy to fold away. Feels like a solid, good quality product. Very easy to assemble and collapse- very happy with it. Quite heavy though, so best used at home or in the garden. Brilliant playpen, great size and love how small it collapses down when not in use. Keeps my 8 month old safe from my 4 year olds small toys and gives me peace of mind when I need to leave the room to do jobs etc. My 4 year old likes to climb in via the handy zip opening and there?s plenty of space for them to play together. So easy to put up and down with a nice wipeable base for the inevitable spills. Good price for an essential bit of kit for our family. Simple to assemble and easy to transport anywhere. Only had it a few weeks so can not comment on durability. It was for my grandson ….my daughter was very pleased with it and says it is very versatile!!!! 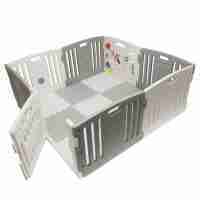 Great playpen, very easy to use. Amazing product! Recommend this to every crawling toddlers parent! This is absolutely fantastic. I had been shopping around for a while, debating on whether I needed a play pen. It’s exactly like a folding camping chair. It was so easy to open and clip together. It has a little zip around door too. In my mind I thought this is a gamble, there aren’t many reviews? I’m pleased I went with it and I highly recommend. A soft and spacious enviroment perfect for play the Venture All Stars JOY creates a safe play area for you baby in seconds! The lightweight, foldable, playpen is ideal for at home, traveling, or even trips to the park or beach. Measuring at 136 x 136 x 75cm / 1.4 square meters when fully assembled & 23 x 23 x 78cm when folded down, it’s large enough when it’s up yet small enough to pack away into it’s handy carry bag! If you’re looking for a playpen for your little one that is truly portable, check out the All Star JOY folding playpen. The playpen can be opened quickly creating a safe play area for your child in seconds, it’s lightweight and foldable frame makes it ideal for use at home, when traveling, at the park or a day at the beach. 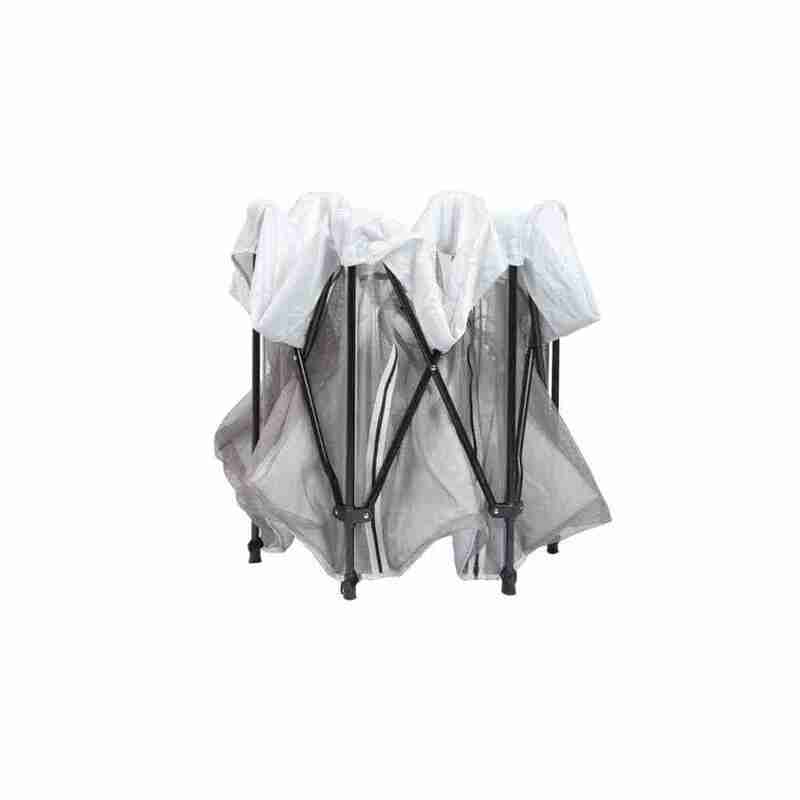 Measures 136 x 136 x 75cm / 1.4 square meters when fully assembled & 23 x 23 x 78cm when folded down. Small enough to pack away into it’s handy carry bag! The Venture All Stars JOY is perfect for families that are looking for a playpen that’s just as at home outside as it is inside. The JOY features an innovative folding system that allows it to be put up and taken down and packed away within seconds. Not only that but it also features weather resitant materials, meaning it won’t be as affected from outside weather as items like wooden baby playpens.